Welcome! 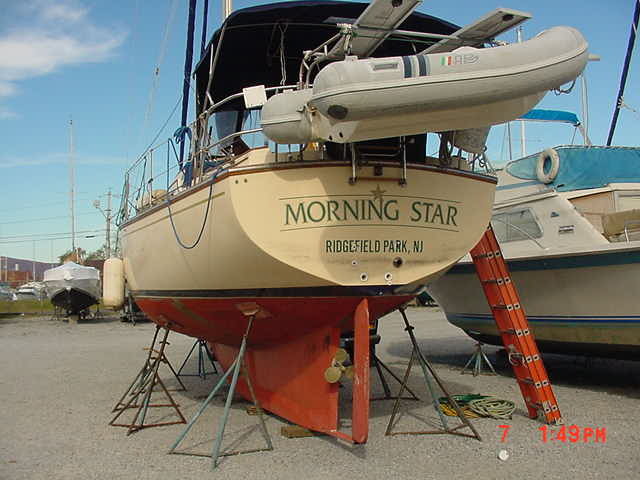 This is the home of Morning Star, a beautiful 1992 Island Packet 32, Hull #84. When not sailing she is moored in Eastchester Bay, City Island, NY or wintering on the hard in Stony Point, NY. 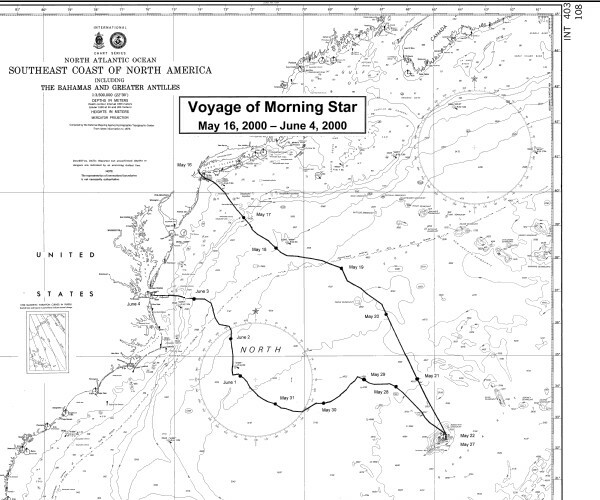 Photo left as Morning Star was being outfitted for our successful 2001 double and 2002 double NY / Bermuda / NY leukemia fundraising passages. 1. LLinear Autopilot Actuator Shelf I constructed last May, fabricated entirely of mirrored pieces of mostly 3" aluminum angle, bolted together. 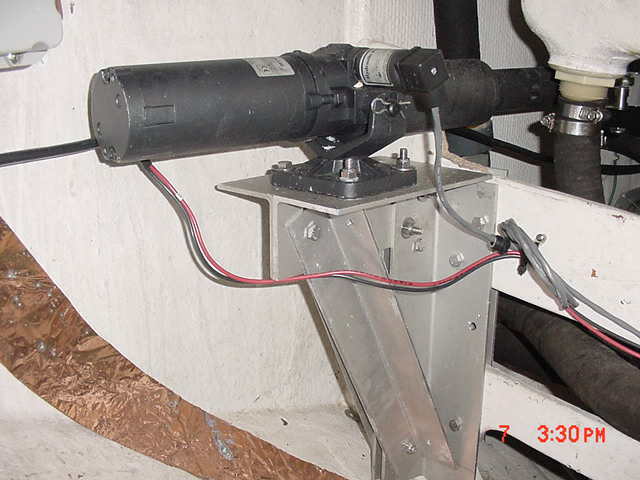 The assembly is attached to plywood bulkhead with through bolts to backer plate. 2. 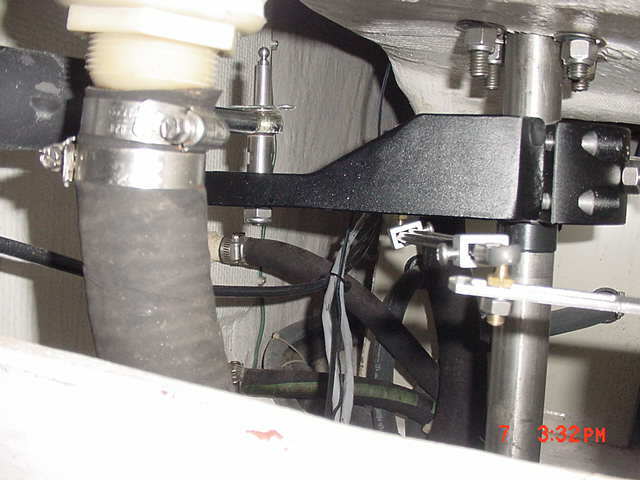 The INFAMOUS Rudder Position Transducerinstallation. Unit has been fastened to forward bulkhead of aft compartment, off lazarette. Control arm is then fastened to underside of A/P tiller arm. 3. 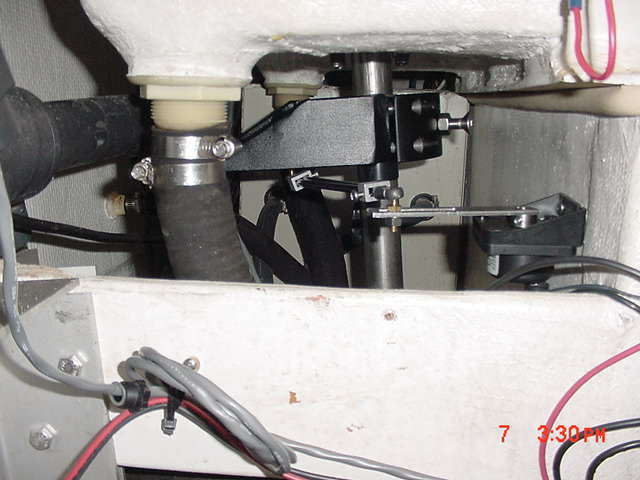 A/P Tiller Arm has been clamped to 1 1/2" rudder stock at a height that corresponds to A/P ram. Rudder stock had no key way so I drilled a 12 mm x 12 mm deep hole in rudder stock to accept 12 mm set screw shown. 4. 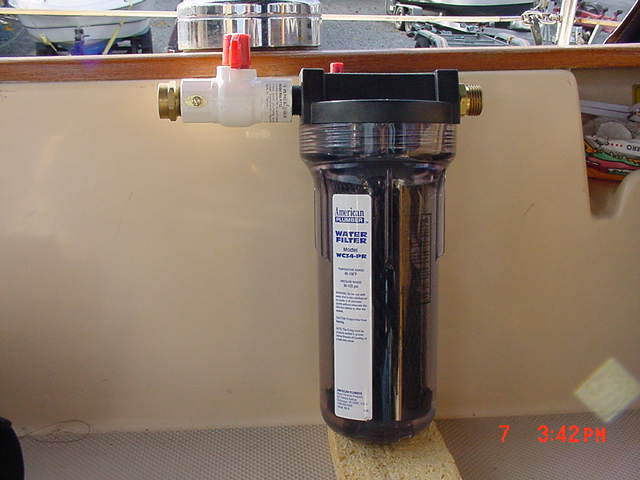 Tank fill Water Filter Assembly you can put together yourself for less than $30 bucks, shown leaning against coaming is filter cartridge, plastic ball valve and two hose adapters, missing is second ball valve so you can seal in water, protecting the element. 5. Fresh water system Pressure Accumulator & filter which I have opted to install before the pump (filter, that is). Accumulator definitely cuts down on recycling of pump. Assemble this system for less than $40 bucks. 6. Helm Instruments and Pods. 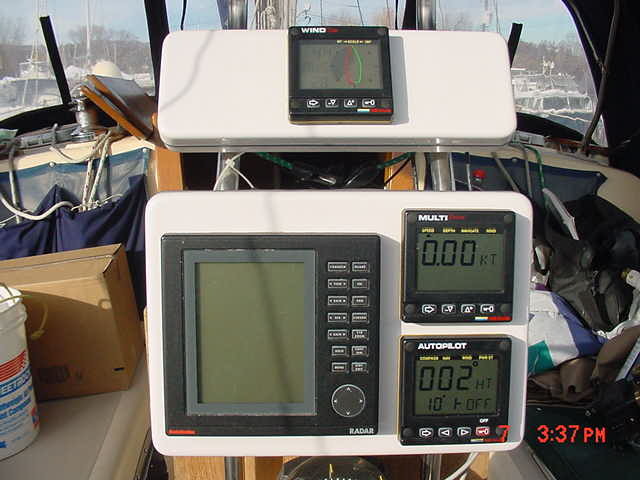 Includes Autohelm 2K Radar, Nexus digital Wind display, Nexus Autopilot display and Nexus Multi display for Speed/Log, Depth, Navigation & additional wind info. Radar and Nexus Network are interfaced together along with Garmin GPS not shown. Nexus Hand Held Remote is below.